What better way to explore India than by travelling through its deep spiritual vibrations. With our specially designed Yoga Trails we offer you holiday of a lifetime where days start with sun salutations and often end in kirtans and mantra chantings. 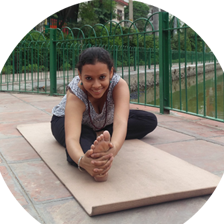 Yoga & meditation sessions with our facilitators have sometimes been defined as life altering. Our aim is to throw light upon different spiritual paths be it dance, music, yogasana practice or deep meditative practices. All this while travelling through this riot of experiences called India! At our retreats you get a glimpse of the yogic way of living. We believe that each individual has their own path of self-discovery. Not sure how to travel with us? Here are some ideas. You can simply join one of our spiritual trip to India and enjoy these yoga holidays India offers with the company of new like minded people as you experience different parts of the country. Do you already have a group and want to organise yoga holidays with them? Choose from one of our many special Yoga Trails and get discounts. It is an absolutely pleasure for us to collaborate with yoga teachers and practitioners from all over the world and organise special interest Yoga Holidays India has on offer. "She offers glimpses of the yogic way of life as she leads you through a spiritual trip to India and has great insights on travelling through this vast sub-continent." Want to Call/WhatsApp/Duo/Skype with me instead ? How about a good old fashioned email ? Motorcycle Tours India, Motorcycle Tours Asia, India Motorcycle Trips, Himalaya Moto, Motorcycle Road Trip, India Motorcycles. Yoga Retreat India, Spiritual Trip to India, Yoga Holidays India, Wellness Retreats, Yoga and Meditation, Spiritual Retreats.